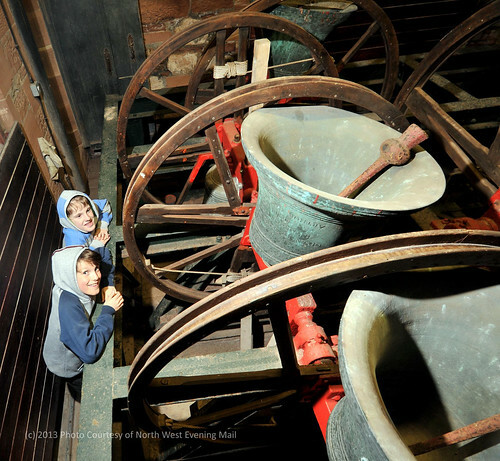 Barrow Bells - GALLERY 11 - North West Evening Mail photographs. 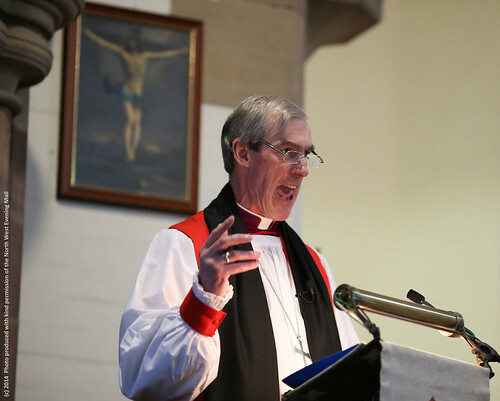 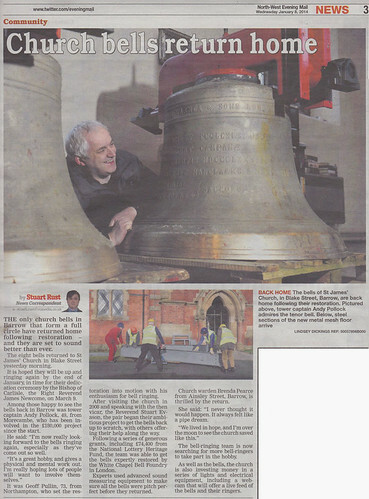 As such, all Photographs © North West Evening Mail. 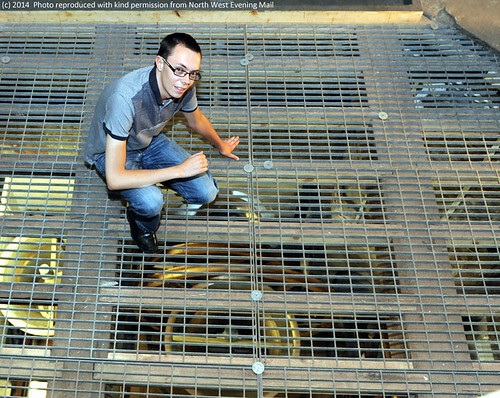 Please refrain from copying these images without first obtaining permission directly from North West Evening Mail. 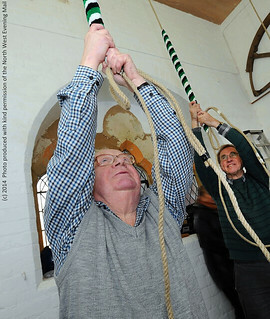 If you would like a copy of any of these photographs, the original (and better quality) images are available to purchase. 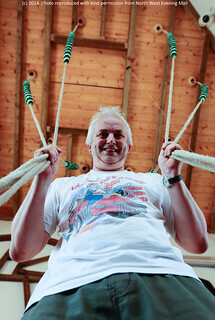 links to individual photo s on the NWEM PhotoSales are presented alongside each photograph. 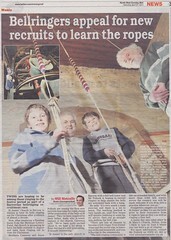 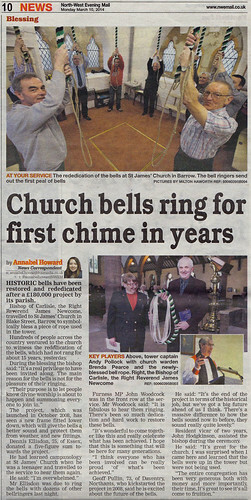 "HUNT IS ON FOR BARROW BELLRINGERS"
was published on Saturday 27th April 2013. 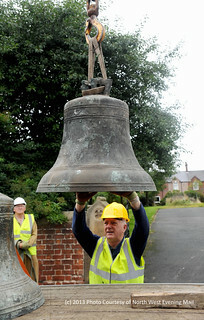 NW Evening Mail PhotoSales Slideshow. 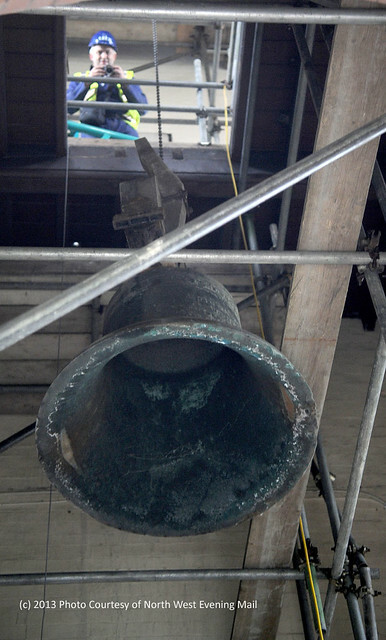 Pricing Information available here. 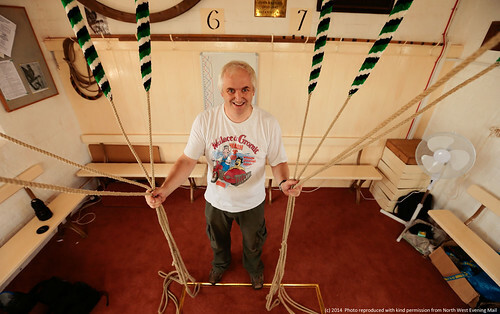 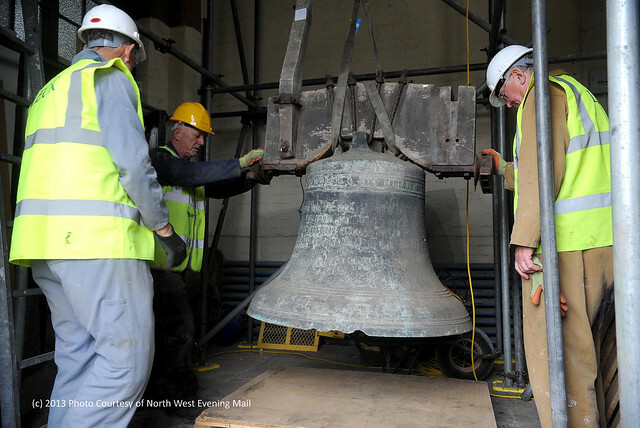 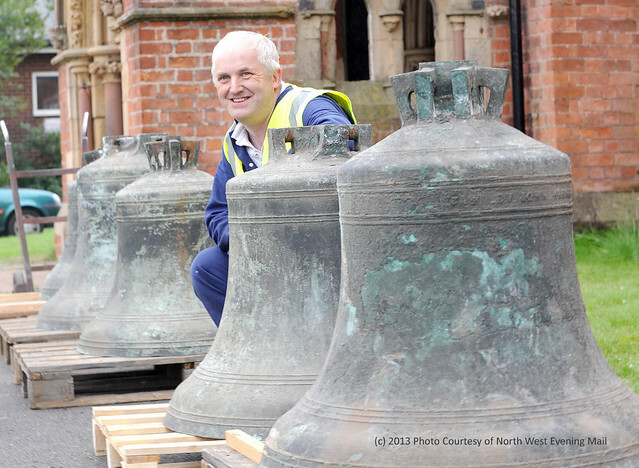 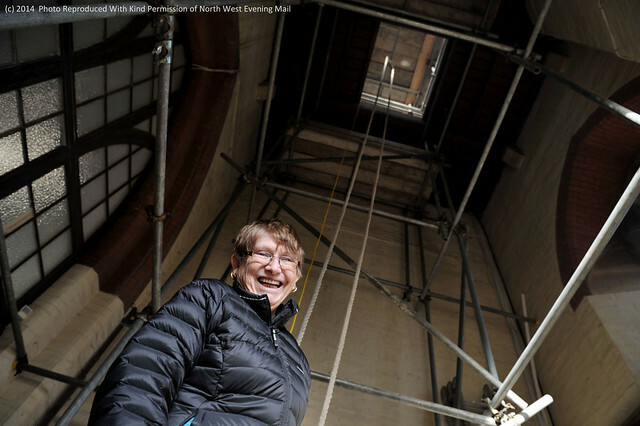 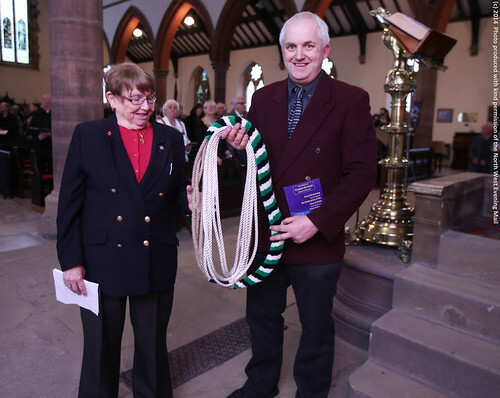 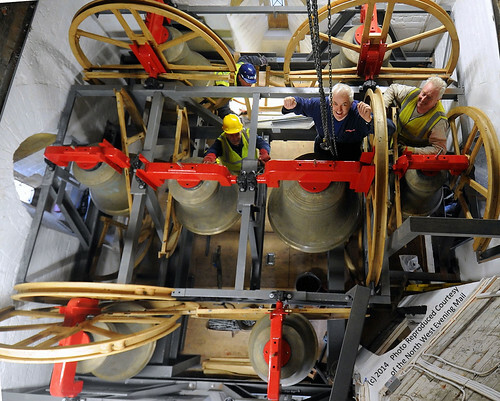 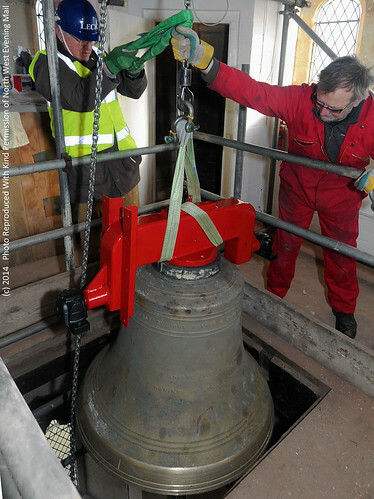 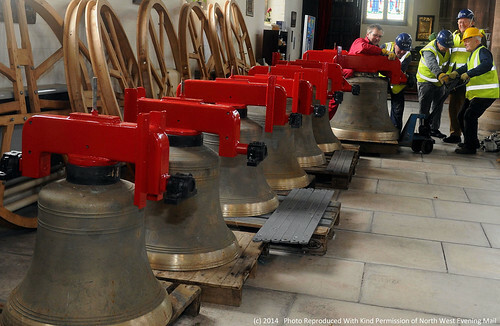 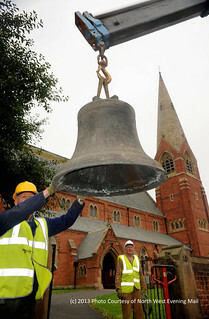 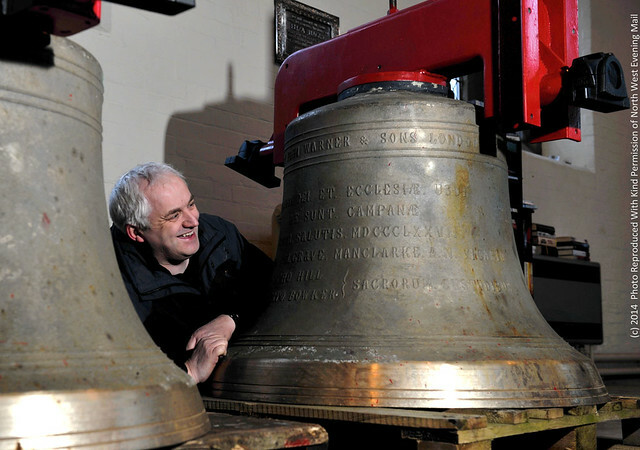 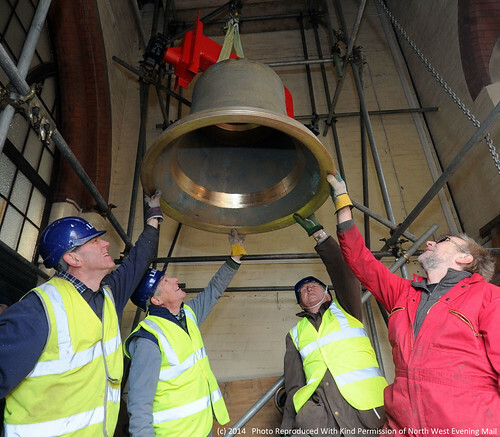 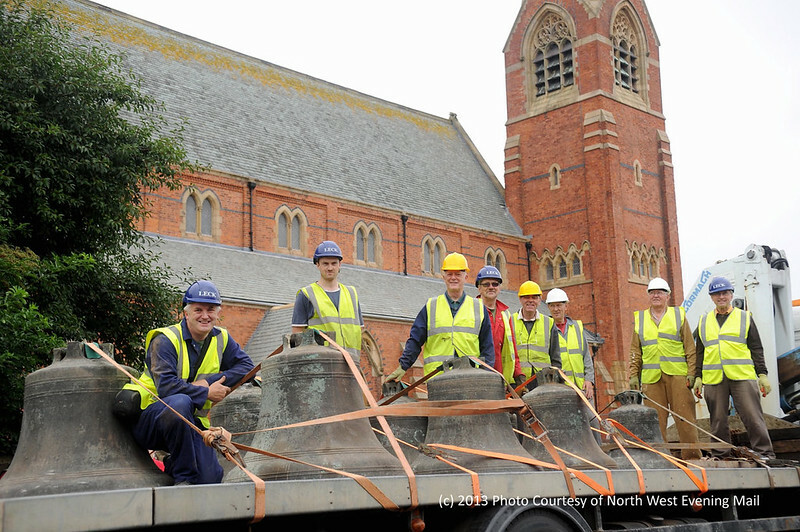 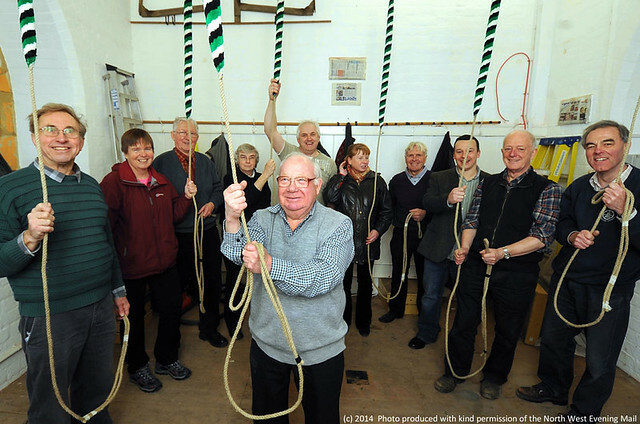 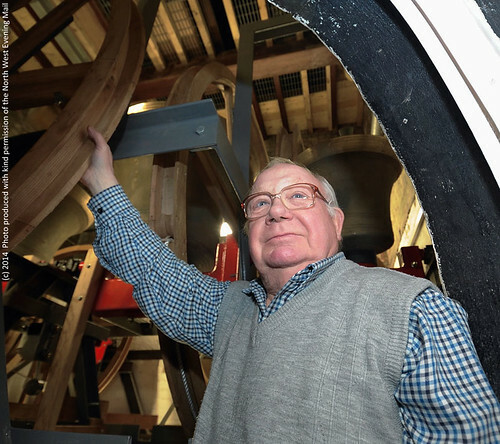 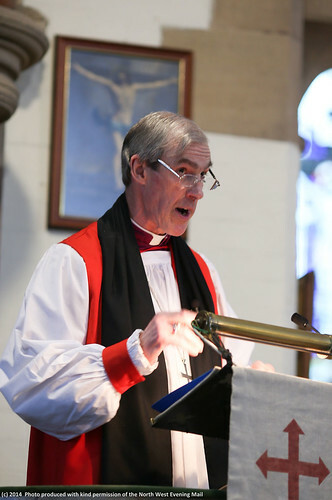 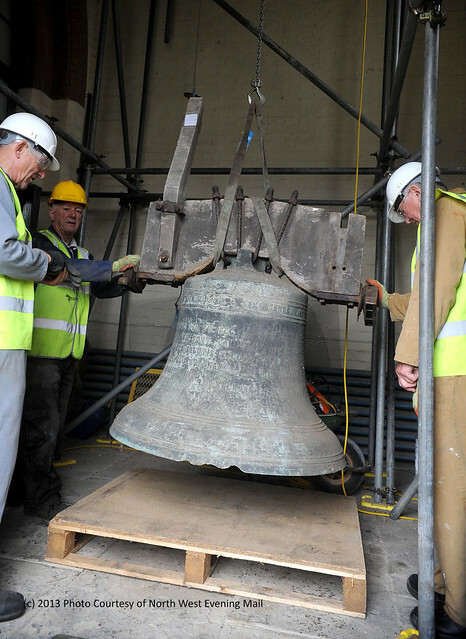 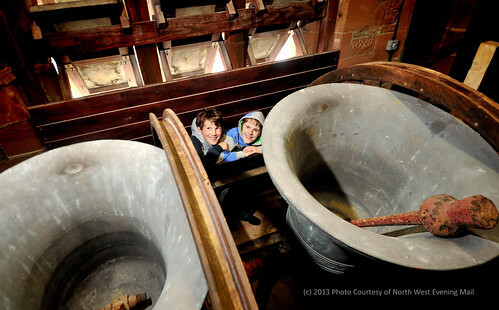 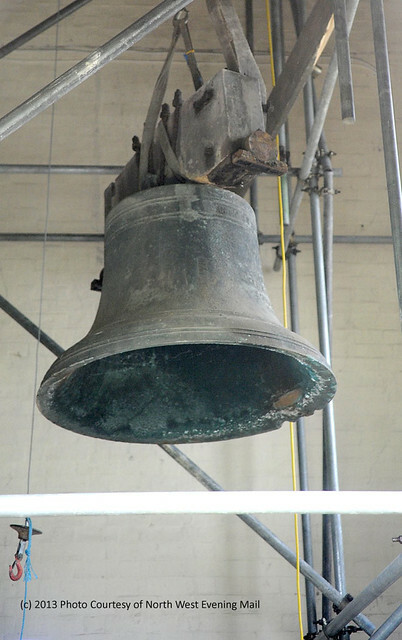 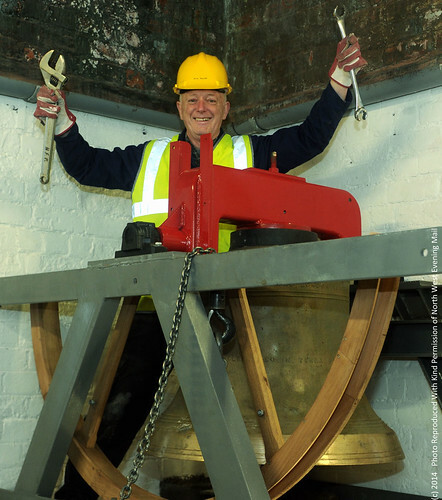 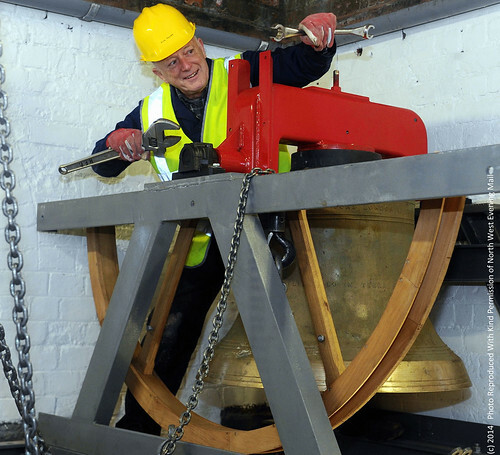 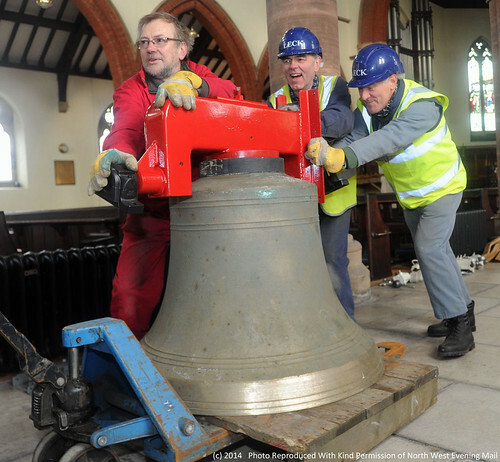 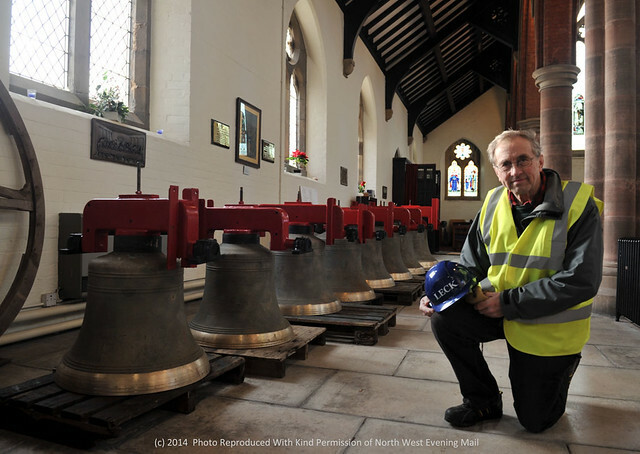 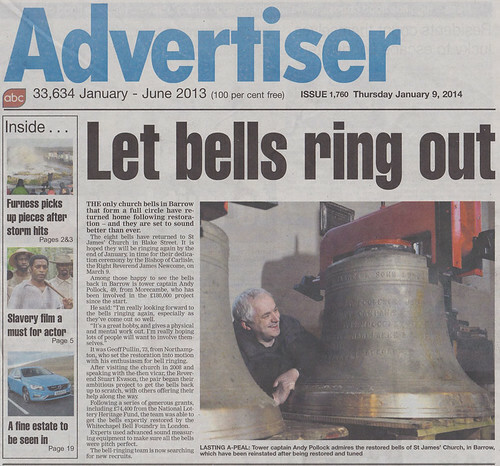 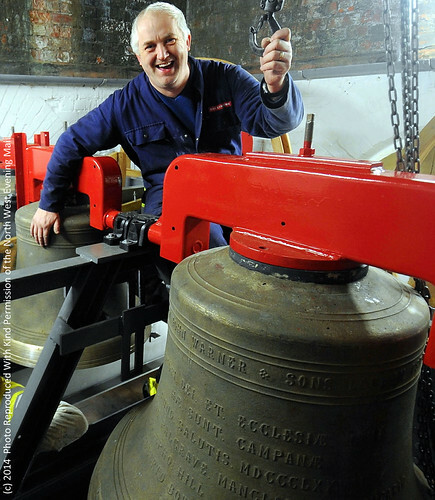 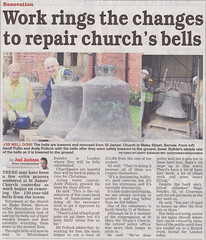 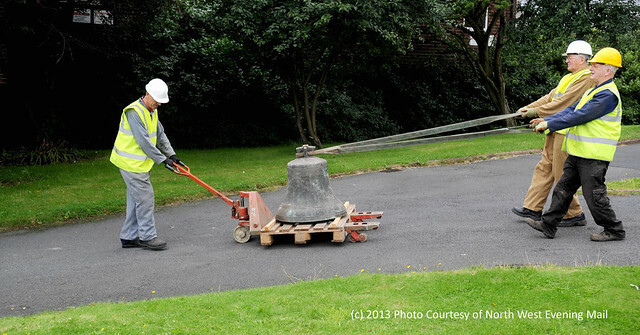 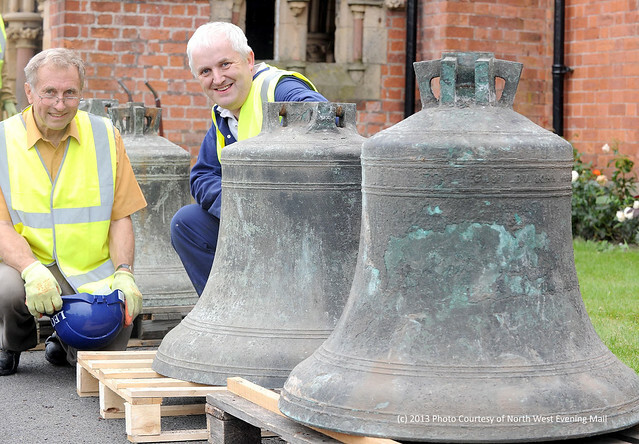 "WORK RINGS THE CHANGES TO REPAIR BARROW CHURCH�S BELLS"
was published on Thursday 15th August 2013. 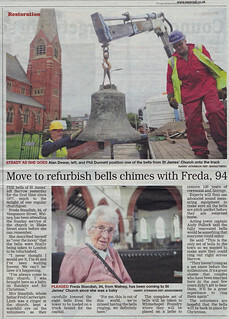 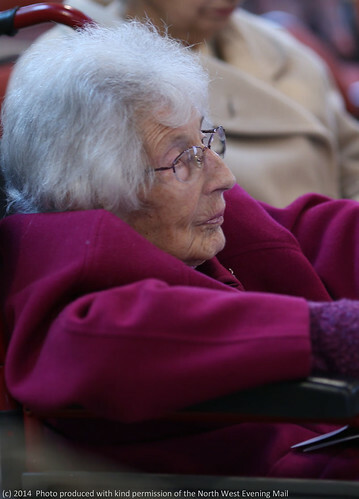 "MOVE TO REFURBISH BELLS CHIMES WITH FREDA, 94"
was published on Friday 16th August 2013, but not online. 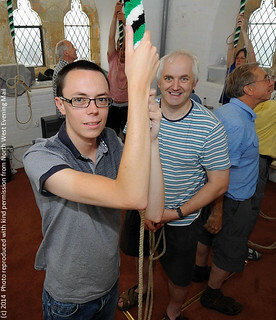 at the test ringing of the bells. 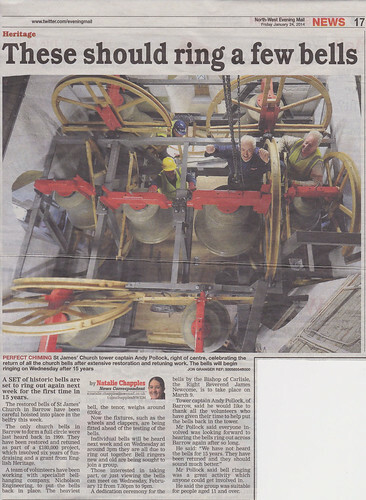 since they fell silent 15 years ago in 1999.
on Thursday 30th January 2014, titled: "
Restored bells ring out for the first time this century"
NW Evening Mail PhotoSales Slideshow. 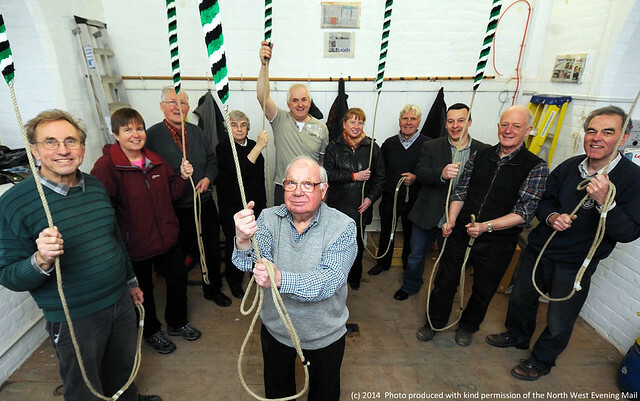 Dennis Ellisdon [centre] surrounded by [L-R] Geoff Pullin, Jo Sweeney, Keith Newby, Carole Pullin, Andy Pollock, Louise Nixon, Owen Osmotherley, Carl Hallows, Alan Dewar and Hugh Pettifer. 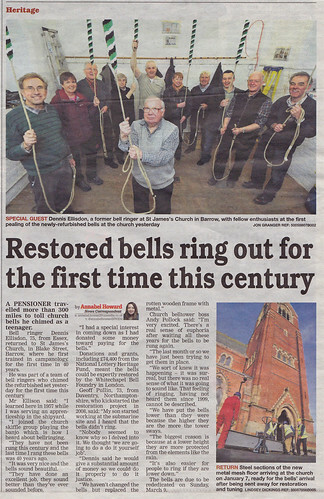 This group of images were taken on Sunday 9th March at the rededication service for the restored bells, and reported in the North West Evening Mail on the following day (Mon 10th March). 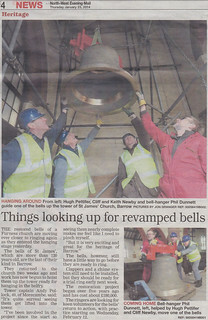 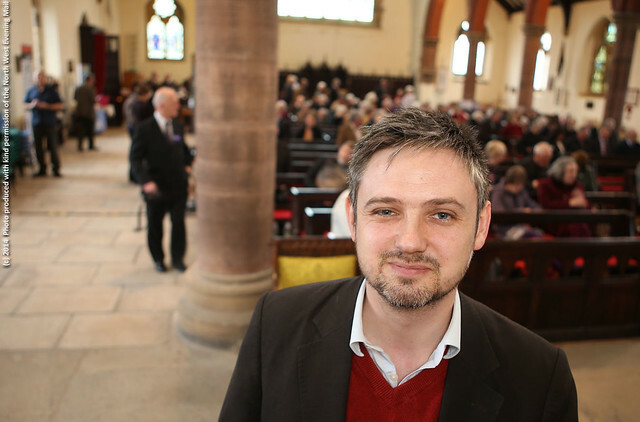 John Woodcock MP comes to lend his support and see/hear the restored bells being rededicated. 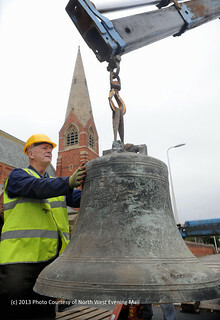 symbolising the newly restored bells. 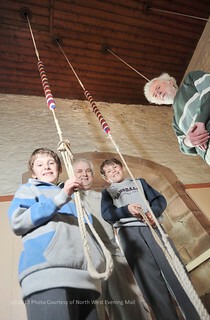 Ringers who rang the bells briefly in the middle of the rededication service. 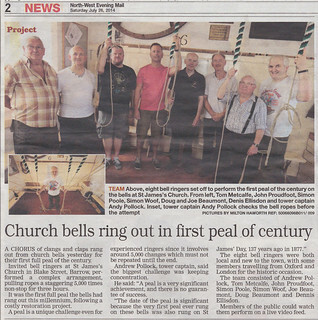 This group of images were taken on Friday 25th July just before the first full peal in 20 years was rung on the restored bells, and reported in the North West Evening Mail on the following day (Saturday 26th July). 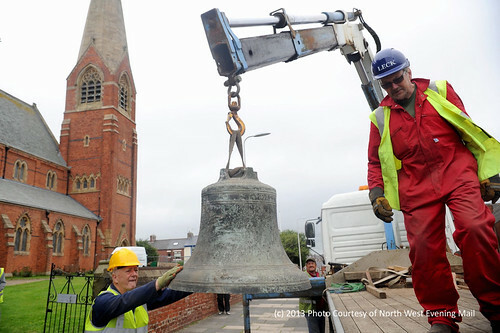 NW Evening Mail PhotoSales Gallery. 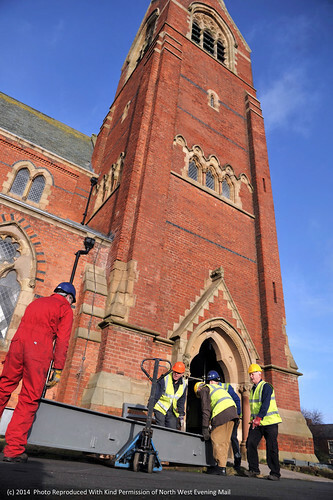 Pricing Information available here. 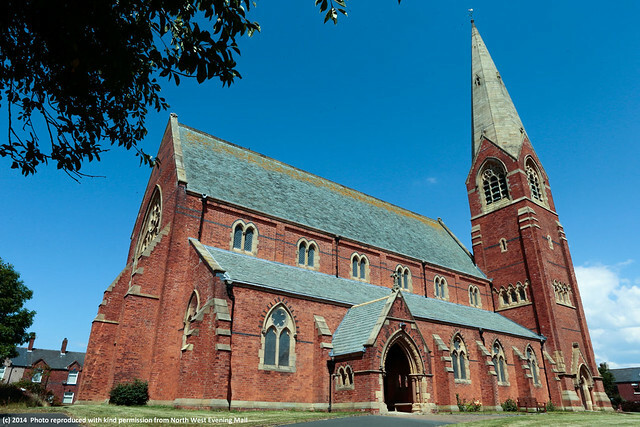 External view of St James - magnificent Paley and Austin designed church. 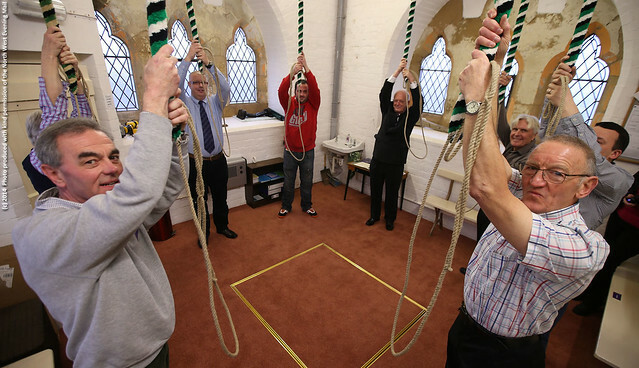 lowers and gathers the ropes before the peal. 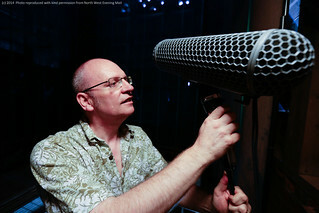 prepares microphone for live audio feed broadcast on the internet. 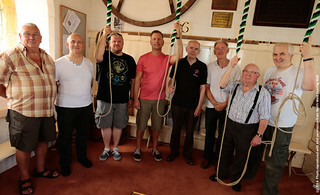 Alternative photo of peal band. 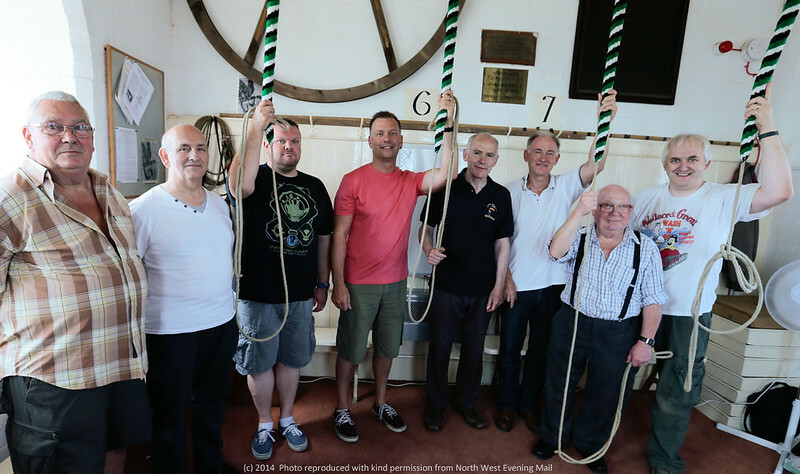 L-R: Tom Metcalfe, John Proudfoot, Simon Poole, Simon Woof, Doug and Joe Beaumont, Denis Ellisdon and Tower Captain Andy Pollock. 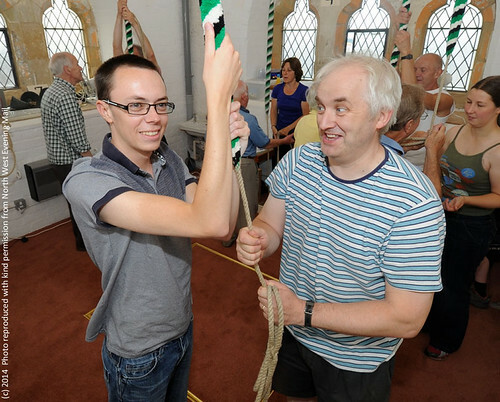 This group of images were taken on weekend Sat 26th and Sun 27th July during training course in which a NW Evening Mail reporter Jonathan Robinson came and learned the basic bell handling techniques. 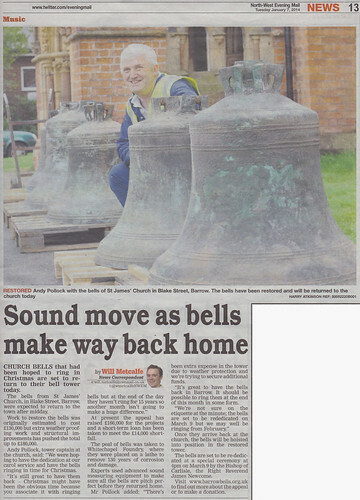 The photographs appeared in the North West Evening Mail the following week (page 3 on Wednesday 30th July). 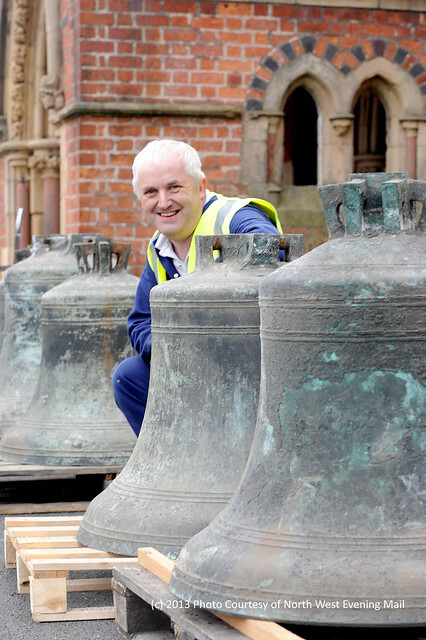 Jonathan Robinson (NW Evening Mail reporter) is introduced to St James' church bells from the old belfry.